Many of us would have used Microsoft excel spreadsheets for work and personal needs for ages. Most of us are aware, for past few years, these worksheets are available online as a cloud service. Google sheets is one of many cloud computing document sharing services. 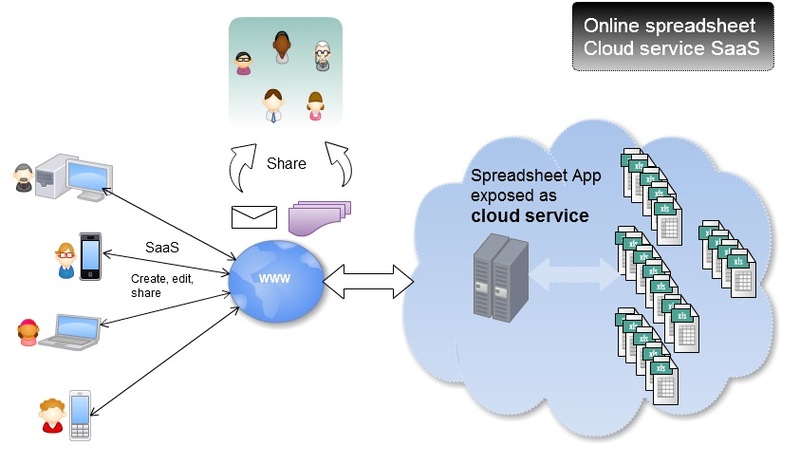 Would you like to create an online cloud spreadsheet service (SaaS) for your customers or fun ? Read on.. I already have a sample sheet saved for you! So type in ‘test’ in the edit box as in below picture. Then, click Open button. You will see the spreadsheet loaded as in below picture if you have the service up and running. Modify the Quantity, Price or Long/ Short column. 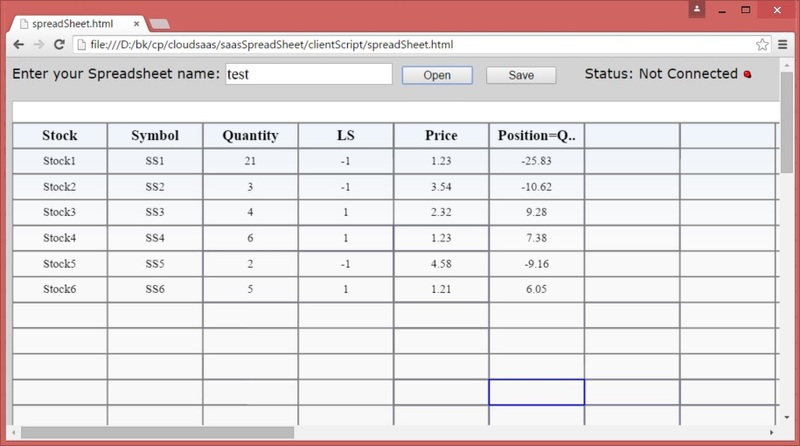 You will see the Position column computed automatically based on the formula. As you will know, you can save and retrieve the document. In case if you would like to start fresh, key in a new name. Then, click Open. You will get a fresh sheet to start. Key in new data and math formula to play. Still, there are many more elaborative advantages of cloud computing. That is the reason, this technology is expanding fastly. Secure (SSL/TLS) connection to your users is important. This is a little extra step. At times, this means you need to get a security key from valid CA, may need static IP, probably go through extra verification process. But quite worth. Compare the tradeoff – Your user’s secure privacy vs unnecessary eavesdropping. Let’s begin by defining few requirements. 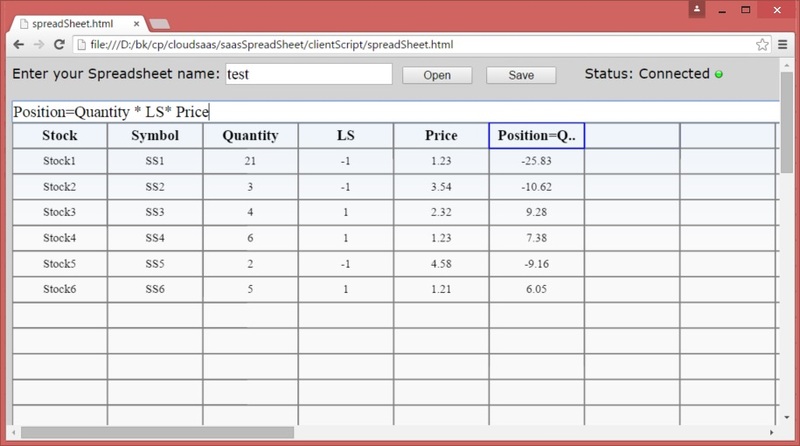 We would like to build a service that exposes spread sheet workbook. For brevity, let’s support few basic functionalities. 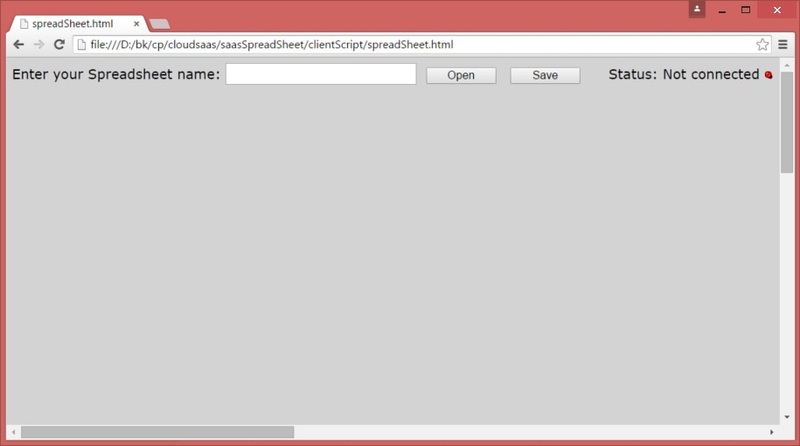 First line of main function creates a html5Stream object. Line, two starts the service. Line 2 is a blocking call. So the server will keep running until this call returns. Let’s take a look at key part in startServer method. All this method does is accepts a new connection from the client. In our case, the client is web browser. Accept call on Socket will return when a client attempts a new connection. Upon new connection initiation, the call handling is directed to OnAcceptConnection Method. Then, it loops back to wait for another new client. This function behaves like an office reception staff. Upon a new visitor entering the work place, the reception staff redirect the guest handling to appropirate personnel and goes back to take new calls/ visitors. This completes one round trip of features presented by this spreadsheet. I would like to thank you for reading this article. I would love to hear back from you. If you like this article, please vote for this article at top of this page and leave your comment. Many thanks to muParser, the math parsing library used in this grid (Reference 4). It’s pretty fast expression parse library. Thanks to https://cacoo.com. I used their online tool for creating diagrams for this article.